Slotland is continuing it's 16th birthday celebrations with a technical upgrade to some older games and more casino bonuses. Although they're still among the casino's most popular games, Slotland’s older games needed an upgrade to make them look and sound better and to make them work better on mobile devices. The unique casino, which creates all of its own games, has just introduced HTML5 versions of Fruit Mania, Pearls of Atlantis, Tikal Treasure, Jewels of the Ancients, Witch’s Brew and Lucky Ducts as part of its sixteenth birthday celebrations. “Most players choose the Flash version of our games,” said Michael Hilary. “But the HTML5 versions are best for some mobile devices.” The casino’s ten newest real-money online slots were already available in both Flash and HTML5 versions: Grand Fortune, Piggy Bank, Treasure Island, Super Sevens, Air Mail, Ice Queen, Turbo GT, Carnival, Greatest Hits and Double Luck. Slotland has always been generous with bonuses so yes, of course there are more birthday bonuses this week! iUntil Sunday you can claim a 100% match bonus on your first deposit, 70% match bonus on your second, and 40% bonus on all other deposits made this week. If you've been playing at Slotland for a long time then there's an extra bonus for you. There's a freebie this week for all players -- but bigger freebies for those that have been with the casino for awhile. If you've been at the casino more than ten years you'll get a $64 free bonus. Those that have been at Slotland for 6 – 10 years will get a $48 bonus. A $32 free chip will go to players that have been playing for 1 – 5 years and even new players will get a $16 added to their account when they logon this week. Slotland’s newest game is in no need of a technical upgrade. Grand Fortune, is an amazing retro-style fruitie with a Free Spins feature. It has traditional symbols like cherries and lemons and a Free Spin Meter that displays remaining free spins and their multiplier value. The casino hopes to unveil a new Egyptian-themed slot game during the birthday celebrations this month. 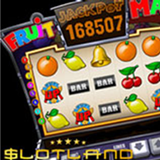 Most of Slotland’s slot games are tied to one site-wide jackpot which is approaching $200,000. The casino could be celebrating a record-breaking jackpot win before the birthday month is over.